There are countless reasons why leaders can feel disappointed in ministry. I’ve had my fair share of disappointments, and I bet you have, too. It’s true, no matter how hard we work, often things simply don’t go the way we plan or hope they will. The project you poured your heart into gets scrapped. People drop the ball, and you’re left scrambling. You can’t see the fruit of your countless hours of investment. A tense working relationship comes to a head. Your contributions to the ministry are overlooked. You’re at odds with other leaders over vision and future direction. You lack a mentoring friendship you desperately desire. Ministry demands increase tension at home. There’s a never-ending turnover of volunteers. You’re sidelined in ministry when you’re raring to go. In Luke 7:18–23, John the Baptist may have felt the pain of disappointment as he sat behind prison bars while ministry moved forward without him. Did he struggle with doubt over why God would let him languish in prison while there’s so much work to be done? Did he question God’s sovereignty? Did he wonder whether Jesus cared for him? Did he question if Jesus was really the Messiah? The ministry of Jesus wasn’t turning out to be what John anticipated. Jesus was changing water into wine and healing paralytics instead of waving a winnowing fork. And John surely didn’t predict being thrown into prison for publicly rebuking Herod Antipas’ unlawful marriage to his brother’s wife, Herodias (Luke 3:19–20). Maybe, like John, you know that disheartening feeling when ministry doesn’t turn out as you expect. A few years ago, a friend of mine was hired to be a Women’s Ministry Director. The timing seemed perfect. She’d been serving and growing as a leader in her church, her marriage and family were thriving, and she was being mentored by godly women. Brooke’s heart said “yes” to God’s calling. Within six months, she was diagnosed with stage 4 breast cancer. After a couple of years of debilitating treatments and surgery, the cancer didn’t back down and the battle raged fiercely. When another devastating tragedy struck her family, Brooke recognized God was asking her to lay down the ministry she loved. In the story God is writing of her life, it became clear this chapter was concluded. Brooke had run her race triumphantly and crossed the finish line even though some people questioned God’s plan for this sharp and compassionate leader. A ministry that began with great vision and hope seemed to be ending prematurely. I expect Brooke will be among the saints who hear directly from the Master’s lips, “Well done, good servant!” (Luke 19:17). During Brooke’s ongoing cancer journey, my friend garnered a huge social media following and so her influence carries on with a new, unexpected platform. During my seventeen-year tenure of serving in vocational ministry, I’ve experienced almost every kind of disappointment. Ministry is rarely what I imagine it will be because we live under the curse of a broken and sinful world. I fall short of being the humble, selfless servant I long to be, and there are times when my struggle is the direct result of my pride and trying to work through human effort instead of relying on the Spirit. There’s also a tendency to believe that if we’re doing the “right” things for the “right” reasons, then ministry will go according to our expectations. If you’re in ministry, you are making daily sacrifices to serve Jesus, which can lead to a false belief that we deserve a smooth-sailing ministry. We forget that God is more concerned about shaping us rather than using us in ministry. It’s through sailing on tumultuous waves that endurance, character, and gospel hope train us to walk worthy of our calling. In the 1960s, Helen Roseveare was an English missionary doctor serving in the Congo. There were times in Helen’s life when she admitted feeling disillusioned and unfit for the task. Whenever ministry got particularly tough, she’d ask herself, “Is it worth it?” There was one point when Helen was strongly advised to leave the country because of guerilla warfare and a looming civil war. Helen chose to stay in the Congo despite the threatening danger. All of us have the privilege of being called to be His servants. Jesus said that He Himself didn’t come to be served but to serve and to give [which we should hold] in the back of our hearts all the time. We haven’t been called to some big outward thing, to be written about or publicized; we’re called to serve Him. We serve Him because we love Him. Whatever we’re doing we’re doing for Jesus and doing for Him to be uplifted. . . . When there’s a problem and when you feel you’ve reached the end of your tether, He is there. He knows. He’s been through it all. He’s there to encourage you and strengthen you and help you and prompt you all the way. Even if you can’t see any point in what you’re doing, and sometimes it does seem pretty pointless, but nevertheless, it’s for Him. He knows what He’s doing and why. Helen Roseveare, John the Baptist, and so many others join the army of saints who ran their races well, not because there weren’t moments of disappointment but because Christ is worth it. As the chosen forerunner to Jesus, John the Baptist may have wrestled with doubt but he was clear about one thing. He knew exactly where to take his disappointments: straight to the Savior. Jesus pointed John to Truth to find hope that everything is going exactly according to plan. There’s a sense that Jesus was saying to John that all the prophecies and promises about Himself—proclamations of good news and of the judgment to come—will be fulfilled in God’s perfect timing (not man’s). John’s source of comfort for disappointment is exactly what you and I need, too. His divine power has granted to us all things that pertain to life and godliness, through the knowledge of him who called us to his own glory and excellence, by which he has granted to us his precious and very great promises, so that through them you may become partakers of the divine nature, having escaped from the corruption that is in the world because of sinful desire (2 Peter 1:3–4). The LORD will fulfill his purpose for me; your steadfast love, O LORD, endures forever. Do not forsake the work of your hands (Ps. 138:8). For to this end we toil and strive, because we have our hope set on the living God, who is the Savior of all people, especially of those who believe (1 Tim. 4:10). 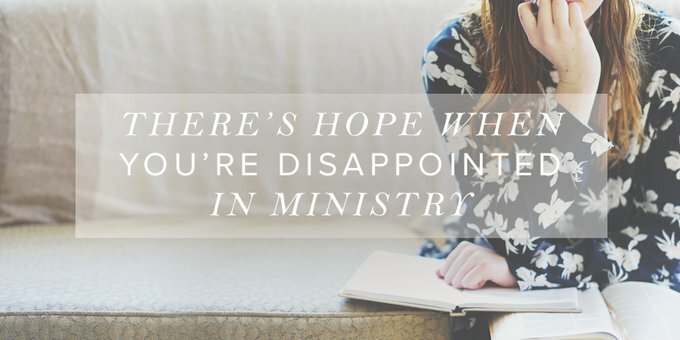 Sisters, you can take comfort that disappointment is a part of our training program as servants of the living God. But don’t let them sideline you. Disappointments will never disappear, but we can find lasting hope as we turn to Jesus and surrender our letdowns to Him as an act of faith and worship. Let’s take a lesson from the great cloud of witnesses cheering us on in the faith . . . Race to Jesus for the gospel hope that never disappoints when ministry disappoints. Previous Post Should I Be Building My Own Platform?